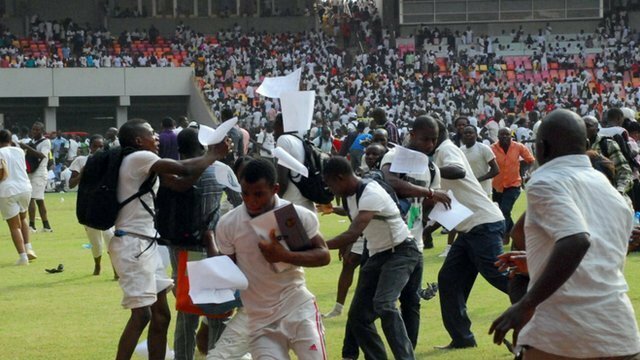 A stampede among jobseekers taking a recruitment test in the national stadium in Nigeria’s capital Abuja has left at least seven people dead and many others injured. A journalist for AFP news agency said he had counted seven corpses. The stampede came during a recruitment exercise by the immigration department. Tens of thousands had turned up to take the test, according to reports. There is a high level of unemployment in Nigeria especially among young people. In 2011, it stood at 23.9%. Survivor Rosemary Ogida told AFP that she could remember being picked up by three men. “I cannot even imagine the number of people that stamped on me,” she said.